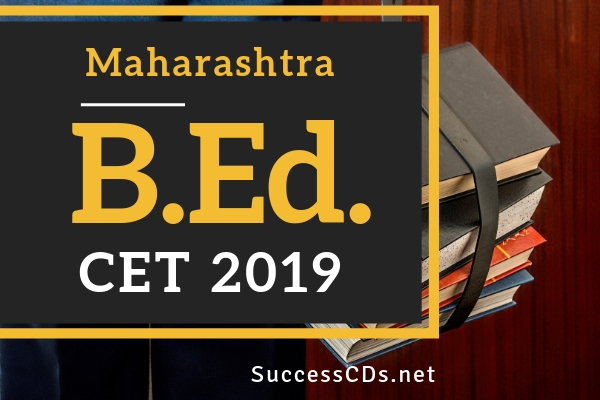 Maharashtra MAH BEd CET 2019 - State Common Entrance Test Cell, Maharashtra State, Mumbai invites applications from the interested candidates for the admission into B.Ed (Regular and Special Education) Course for the academic year 2019. Candidate should be an Indian National and should have passed any Bachelor’s Degree/Post Graduate degree awarded by any of the Universities in corporate by an Act of the Central or State Legislature or declared to be Deemed University under section 3 of the UGC Act,1956 of Minimum 3 years duration of Any Discipline recognized by the AIU, or possess an equivalent Qualification recognized by the MHRD,Govt. of India/NCTE with Minimum 55% Marks for all Categories. Candidates desirous of seeking admission in the English Medium Colleges will have to invariably appear for English Language Content Test (ELCT) along with MAH.-B.Ed. CET 2019 and give specific option for ELCT while filling in the online Application form of CET. No request for this after the CET Application form has been submitted on Line will be entertained by the CET CELL. Aggregate* Marks mean the Grand Total of Marks obtained by the candidate at the Degree/P G Degree on which the Class/Grade Certificate/Degree is awarded by the University. In case the candidates are awarded Grade/s,/CGPA instead of marks, at, Degree/PG Degree Examination, the conversion of Grade/s, CGPA to percentage of marks would be based on the formula/procedure certified by the University/ Institution from where the candidate has obtained the Bachelor’s/PG Degree. The candidate will have to bring the necessary proof to that effect from the University/ Institution. The Eligibility shall be decided based on the basis of the Equivalent marks. The Candidate will have to upload the conversion formula on line while filling the CAP application form. The percentage of marks shall be calculated by rounding off to two places after decimal. This round off will be applicable to the Percentage above the Minimum percentage of marks required for qualifying examination. Age Criteria: - There is no upper age limit for admission to MAH-B.Ed. CET Examination in the Academic Year 2019-2020. Age will be calculated as on 1st July 2019.